This beautiful Tear Drop Keepsake Urn is a symbol of tears of joy as well as tears of sorrow as we remember the wonderful times we shared with our loved one. The keepsake is available in Sterling Silver or Gold Vermeil. 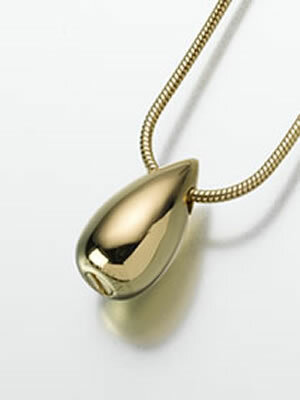 Vermeil pendants are plated with 100 milligrams of gold over silver. The teardrop measures 3/4" high x 7/16" wide. A free black satin cord is included or you may purchase a Sterling Silver or Gold Vermeil chain. A small funnel, filling and sealing instructions, and a care card are included. Each pendant is presented in a small velvet box.